Blind spot detection, monitoring and alert systems from DeDona! Systems that monitor the blind spots of vehicles have become more common but are still not available on many past and current makes/models. Here at DeDona, we believe you shouldn’t have to trade in your ride to experience this highly useful technology, which is why we now offer aftermarket installation of our very own blind spot detection and monitoring system that rivals the factory systems. Our system includes two rear sensors installed in each side of the rear bumper. These sensors are continuously active and watching for objects that approach the vehicle from behind and to the side. The color of the sensors is closely matched to the vehicle’s exterior color so nothing looks out of place. 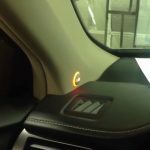 While you’re driving and one or both of the rear sensors detect a vehicle or person approaching, warning lights which we install will light up on the appropriate side of the dash to indicate that it is not safe to turn or switch lanes. These are bright enough to be seen but dim enough to avoid being harsh on the eyes at night. The lights will indicate if an object is in the blind spot, however if you don’t see it and activate your directional to turn in the same direction as the object, an audible beep will sound to get your attention. Two methods of notification help keep you safe from dangerous turns and lane changes. Visit us today for installation! Interested in a blind spot detection system for your vehicle? Visit DeDona Tint & Sound today at 5212 W. Market St. in Greensboro NC, call (336) 851-1300, or request more info online!